This cable wire designed magnetic therapy bracelet is made with 100% stainless steel for long time durability that will not tarnish. It has 2 - 3000 gauss neodymium rare earth bio north facing magnets in each door knob end. The magnets are on the surface and can rest directly against the skin unlike other styles that have the magnets on the inside of the knob. With the magnets on the surface as this bracelet is made, the surface gauss is considerably higher than when the magnets are on the inside. Took care of business. Too soon to tell effect. 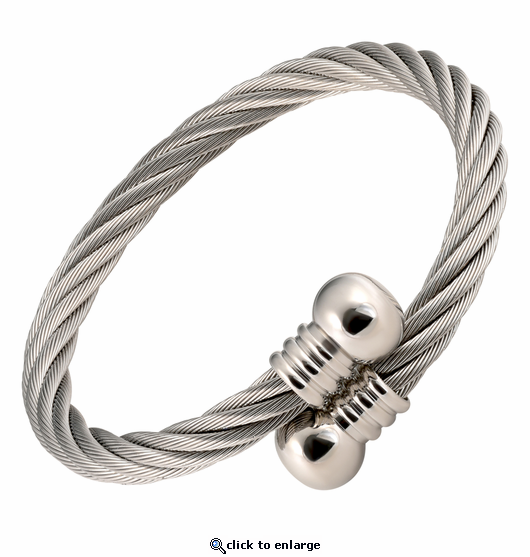 Really like this style bracelet. Very comfortable and sturdy. After having these for about a month I have found that that they are even more comfortable than the steel cable bracelets I had and seem to help even more with the aces and pains. I will be using these on a permanent basis now.